Our trip to the US is about much more than soccer. Actually soccer is the smallest part of it. I’ve been in tears, I’ve had goose bumps, I’ve been excited. None of it has to do with our team playing soccer. Since we landed in the US for a soccer tour, we have visited churches and stayed with families that have been incredibly welcoming to us. 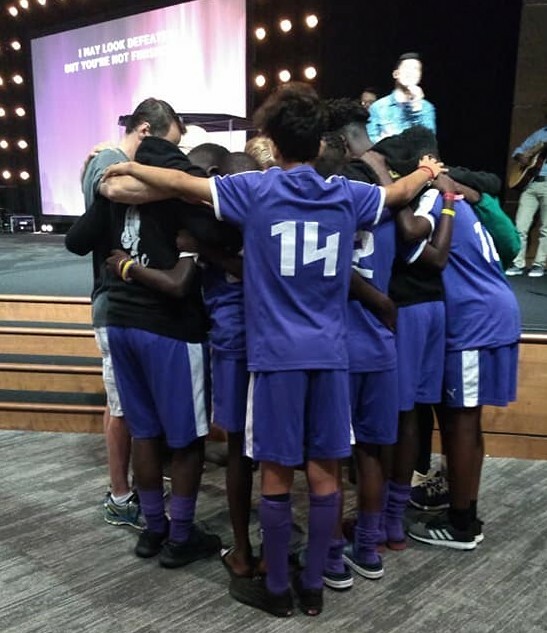 The international team coordinator at the USA Cup in Minneapolis, where we are right now, arranged for us to go to his church, Emmanuel Christian Center, yesterday morning with his wife. We had a match to play at 11:20am, so we knew time would be tight, but I knew we needed to spend time in worship. I knew that this trip was not about soccer. So we went, the church prayed for us, we heard an incredible sermon from former 700 Club host Sheila Walsh. The church was incredibly welcoming to us. Arranging seats and making sure we could get to the field in time for the match. I am a time freak, which doesn’t usually serve me well in Africa, so I was stressing, looking at the clock the whole time. I knew we needed to get out at the right time. When the service was coming to an end however, Jesus simply whispered to me, be still. Sheila presented the gospel, asked the congregation to join her in a prayer of salvation, then invited people to come and receive prayer. 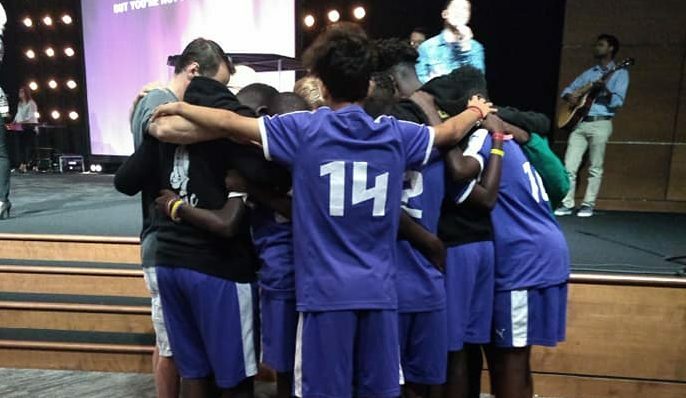 I never expected a group of teenage kids from Uganda to come forward or to pray that simple prayer. But they did. They called out to Jesus asking for his perfect gift; accepting it. We still haven’t raised all the money we needed for this trip. I simply laid my trust in Jesus name when we decided to come while underfunded, something we are pretty used to doing as missionaries. This morning showed me why Jesus wanted us to do that. I felt the feels this morning and it wasn’t the first time. We came by faith that Jesus would meet our needs. I know he will always do that. More importantly, we continue to show His great love. I couldn’t leave any kid behind, this was an opportunity to lift His name higher. A week ago I was almost balling like a baby, tears of joy as I worshiped at Woodside Church in Troy Michigan. I have been praying for years for coach Yusuf, a Muslim, who I got to bring into the house of the Lord that morning. One of our players who is also a Muslim, picked a Bible from the seat pocket and read along. I held back my tears, but I wanted to retreat to a quiet place, fall on the ground and worship our Lord. I just stood still, in the presence of Jesus, paralyzed by His mighty power. I was deeply moved because I knew Jesus name was being heard loud and clear. While staying at the dorms in Minneapolis, we finish each day with a word of encouragement and devotion. I can’t wait to share more and build on our experience of yesterday morning, praising the name of Jesus. What a beautiful/wonderful/powerful name it is!!! Just in case you’re wondering, the game we were headed to was the semifinals of the weekend cup. We lost 2-1. We will start another tournament on Tuesday. In victory or defeat, we lift up the name of Jesus.